In honour of Veganuary, here’s a fantastic vegan curry starring Chilli Pepper Pete’s Naga Masala spice mix, in a homemade curry paste with lots of smoky chickpeas and tender pieces of mushroom. 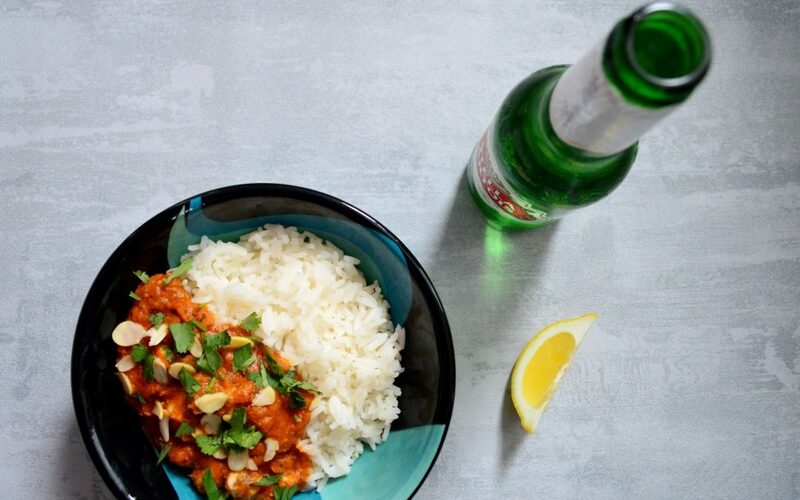 Serve up with a few cold beers for the perfect night in. 1. Start by making the curry paste. First, empty the chickpeas & the liquid from the can into a bowl and microwave for five minutes, stirring halfway through. Then, blend together the chickpeas and the liquid, tomato puree, Chilli Pepper Pete’s Naga Masala, cumin, salt and lemon juice to make a thick, soft paste – you can add a splash of water if it’s too thick to blend properly. 2. Next, dice the onion and fry gently in a splash of olive oil until soft. Then add the curry paste, with a little more water to loosen it up into a nice sauce consistency. Leave to simmer on the hob for the moment. 3. Prepare the rice according to the instructions on the packet. Meanwhile, cut the mushrooms into large bite-sized pieces, and then toast them gently in a dry frying pan until they’re soft around the edges and just starting to release moisture – the point of cooking them separately from the sauce is to keep their chunky texture, so don’t overdo them. 4. Finally, once the rice is ready, divide between two bowls. Add the cooked mushrooms to the sauce and stir through, then spoon on top of the rice and finish with chopped fresh coriander and flaked almonds.